@@Our industry has become obsessed with learning over the last few years. @@ We love to talk about the age of acceleration, complexity and the need to learn new tricks. But what is holding us back is our inability to unlearn some generally accepted paradigms, ways of doing and thinking. "The illiterate of the 21st century will not be those that cannot read and write, but those who cannot learn, unlearn and relearn." Joanna Bakas, Managing Director at LHBS Consulting Berlin had the opportunity to speak at the Golden Hammer 2015 in Riga and was also part of the festival jury. Innovation represents for many companies the key to a successful future. Many CEOs around the globe are prioritizing and investing in innovation; however, the potential for innovation taking place within big organizations often goes unrealized. Stefan Erschwendner, Managing Partner of LHBS, had the opportunity to speak at the Good School’s "Camp Digital" on the topic of “Making Innovation Happen,” where he elaborated on the idea of innovation as well as its implementation inside of an organization. @@For LHBS, today’s dynamic world is not about the survival of the fittest– it’s about the survival of the most adaptive. @@ It is organizations which constantly engage with their environment that are able to seize opportunities for innovation, as they are able to recognize changes in culture and their respective industries and adapt accordingly. How companies innovate is a matter of context. When speaking about innovation, people mostly associate the term with ‘product innovation’ or ‘process innovation’. Innovation, however, is multilayered and can be performed in many ways. Larry Keeley differentiates between “10 Types of Innovation,” which range from configurations of profit model, structure, etc., to the actual product offering and its experience– whether it be a service, brand, or channel. As such, the more types of innovation that are addressed, the more potential the actual innovation has. When it comes to a strategic approach to innovation, we distinguish– following Clayton Christensen– between “Sustaining Innovation” and “Disruptive Innovation.” Sustaining Innovations are geared towards improving product performance or lowering costs, while disruptive innovations are game-changing: they are revolutionary as they create new markets and value networks. Despite the difference between these types of innovation, many successful companies simultaneously pursue both routes. Yet a balance is needed, as many successful companies fail because they put too much focus on current customer needs and neglect using new technologies to develop “Disruptive Innovations,” which could satisfy their future needs. Christensen describes this as the “Innovator’s Dilemma,” whereby companies fail by ‘doing everything right’ by letting their successes become obstacles in changing markets and technologies. Like this, startups and small organizations are daring to experiment and to pursue “unreasonable” ideas (which eventually turn into game-changing ideas) and have great chances in overtaking established players from out of the blue. To illustrate this: Airbnb provides now more rooms than Marriott, the biggest hotel chain in the world, immediately and effortlessly. @@In order to implement innovations, businesses must first differentiate between the areas which innovation can be applied. @@ Every organization has a “Performance Engine,” a framework for day-to-day business operations that mainly focuses on efficiency. Innovation, on the other hand, is unpredictable and not always routine, which complicates its implementation into the Performance Engine. As such, organizations tend to kill innovation as they perform it within the rigid environment of the Performance Engine. Successful innovation demands a separate structure and environment in the form of an “Innovation Engine.” This separate engine provides a collaborative, open structure and all the necessary resources to experiment and respond to new opportunities. The key to creating a sustainable innovation framework for organizations is found in the interconnection of the Performance and Innovation Engines. 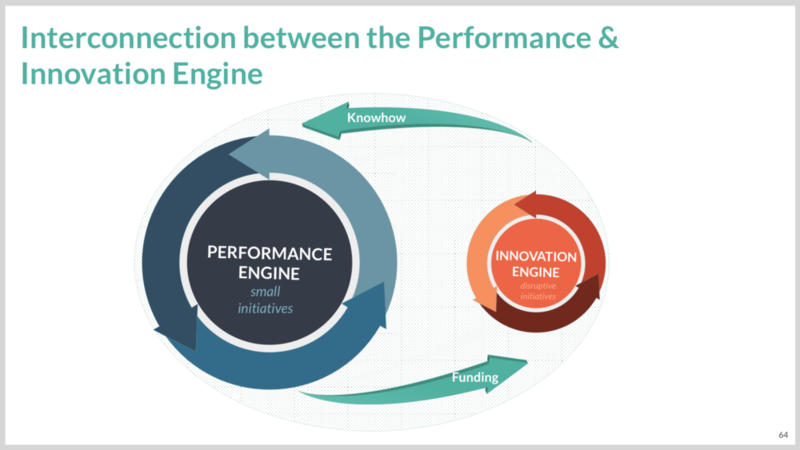 In this ideal framework, the Performance Engine provides necessary funds to the Innovation Engine, which then can steadily nurture the core business with new knowledge and emerging opportunities. While innovation needs to be a daily event within organizations in the sense that it must permeate its core operations, larger scale innovations (e.g. the innovation engine) need breathing room away from the conventions, operational and cultural constraints of daily business. That being said, to be successful it must eventually be integrated into the broader organization in order to be translated into value. In short, while remaining within the company, the Innovation Engine needs its own playground in order to eventually thrive. Please also check out the live scribble, which was done during Stefan Erschwendner's Keynote at the Good School.